Editor’s note: Always understanding kayaking as a place to be and a way to go, not a transport from here to there, Joanne and her husband Doug have paddled since the mid-1980’s and are still exploring the world, sometimes by kayak. They paddled with Eric, Jim and the Rangers a few times in the late 1980’s and early 1990’s and then got (healthily) caught up in their paddling business in southern California. 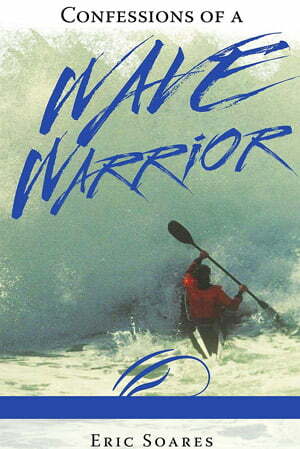 Nowadays, reading Confessions of a Wave Warrior, bit by bit and over and over, puts Joanne back into those special days, with the spirit of the individual Rangers and call of the sea ringing truth and happiness on each page. 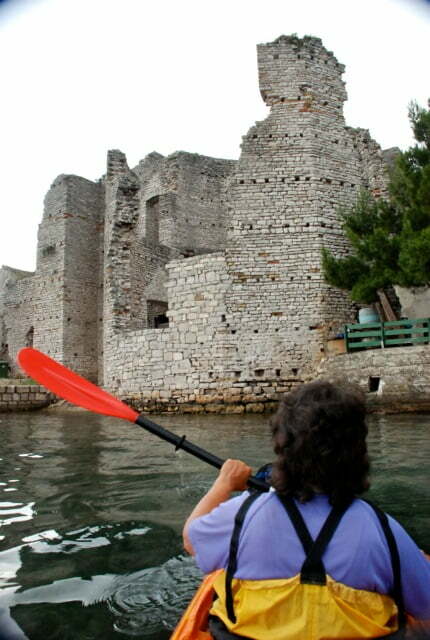 This story of kayak touring along the islands of southern Croatia, in the Adriatic sea, describes one of many coastlines Joanne has explored by kayak. Just spin the globe and pick a line of islands! When getting caught kayaking and tenting in the strongest rain-thunder-lightning storm we have ever seen is the worst thing to happen on a two week paddle, we knew life is great! The Adriatic sea, with Italy to the west and Croatia to the east, is a sea of legends. It offers some quite spectacular coastal touring for those who can handle an absence of giant waves and surf for a week or two. You can explore a Neanderthal cave, paddle up to a second century AD Roman palace, visit the cave where Odysseus lived for seven years because he could not resist the nymph Calypso, and so much more. Our paddling adventure began at the Huck Finn headquarters north of Dubrovnik. We contemplated seven days of paddling, but reluctantly returned after twelve. We could have stayed out another two weeks, as there was so much more coastline to paddle, hiking and snorkeling to do, and ruins to explore. In summary, we kayaked north along the western mainland coast, west across to Mljet Island (pronounced “Milyet”) and around its north end, and down the west coast, winding among several other islands, and returned to Dubrovnik. This segment encompassed two of the six weeks we spent in Croatia from mid-May through June. The paddle north along the mainland was under clear skies, with no wind and thus perfectly calm seas. We paddled close to the limestone coastline to watch the sea life under crystal clear water. Sponges or corals were visible, as were some cherry red anemones and squid. There are very few coves where we can land, as the limestone is everywhere and comes straight down to the sea. But above, on the hillsides, everything is totally green, with pines and oaks and cypress and who knows what other trees. Where there are no trees, there is dense underbrush. On our third night in Polače (the č is pronounced as “ch” in church) a small village on the NW tip of Mljet island, population about 100, a great thunderstorm came in with terrific rain and great lightning and thunder. We watched it from our balcony until we were too tired to stand. The skies seemed pretty clear on our fourth morning in Polače, but the cumulus clouds were rising all around and we knew there would be more rain. We packed our little kayak and headed out the village harbor and down the west coast for what would be an 8 hour paddle of 20 nautical miles, not counting the many ins and outs of the little bays along the way. Soon the skies blackened and, in fact, we could no longer see the nearby shoreline A thunder and lightening show began and, of course, the rain started. 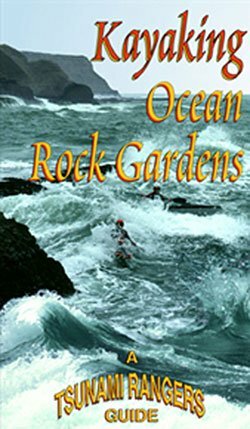 Quickly our environment became truly exciting, alive with sound and bouncy water and steep, following seas. Our bow dove under the waves (the kayak is not as sea worthy as the Feathercraft we have used on so many of our trips) which regularly hit me in the face and chest (the joy of having the bow position!). The highest winds lasted only about 20 minutes, but hard rain continued for two hours. Doug likened it to being under a fire hose focused directly downward on us. The drops were giant and hit the water with such force that they bounced up 2-3 inches before hitting the water again on the way back down. This created a haze on the water which left the sea looking fuzzy. Too, it flattened out all the wind ripples on the surface of the swells and waves making the big lumps seem glassy smooth, even though the sea’s texture was stormy rough. Rain became lighter for a while and the seas calmed down, but soon another set of giant black clouds arrived and we were hit again with a light, sound and water show. After three hours of strong paddling, the sea mellowed and the show stopped, and the day turned sunny and warm. It is funny, the description of Croatian weather in our Lonely Planet guidebook indicates 2 to 3 inches of rain in June. We figure we got 3 inches in each of the 3 storms that day! Yes, we would have sought a landing site early in the day, but steep cliffs prevented any chance of getting off the water. After 8 hours of continuous paddling, we reached one of the only sandy beaches on our trip, in a little cove at the bottom of Mljet island. We set up our tent, an action which we knew was probably illegal, (laws exist because of “fire danger”, but we were very tired), and were soon visited by a fisherman and his nine-year-old son who informed us that we could not camp there. But, of course, we could stay at his home and he would prepare us dinner, for a price. When we agreed with smiles and enthusiasm, he waived the part about not camping and he left his son to guide us to his home up on a hill, after we completed setting camp. In their garden yard the mother prepared a fantastic dinner. The man caught fresh fish and had home-made rachia/rakia and wine, of course. The mother had made the bread, olives and goat cheese, and picked for us a zucchini from her garden. Perhaps the only part of the entire dinner that they did not grow, catch, raise or make were the pickles on the cheese plate and the flour for crepes at the end. Immediately after we returned to our tent, the skies again provided another fantastic light show. Normally we count the seconds between light bursts and sound so we can estimate the distance from us to the lightning, but there were often several flashes each second, and many dozens each minute, so distances were meaningless – we knew the thunderhead was immediately over our heads. Often a thunder clap would start to our right and roar and crack continuously until it reached our far left! Fortunately our new light-weight tent held up and we slept very dry and well … after three hours of being stunned by this show. All was calm and sparkling the next morning. During a crossing we passed two dolphins in the channel, not common here. Too, we passed a tiny channel known for the fierce sea battle between Caesar and Pompey in 47 BC. History is here, everywhere! We went to enjoy a couple of days on Šipan Island (pronounced as “Sch” as in Schwartz), biking all over the island, including to the only other village and many buildings dating from the 15th century. Again, great wandering! Our home is a harbor-side apartment recommended by four Israeli kayakers who were launching as we first landed. We have encountered them and six British kayakers here and on Mljet, all decked out in proper touring kayaks! A fine place to paddle! 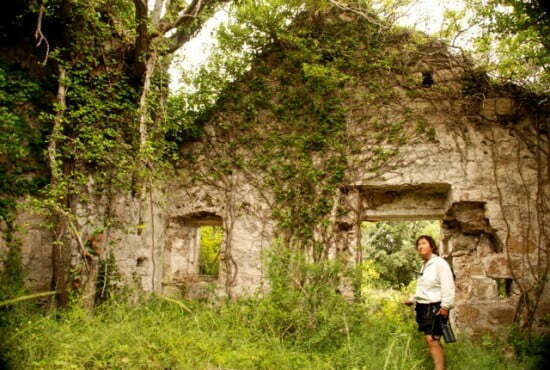 Exploring Sipan Island, Croatia where the forest is retaking an ancient building. There’s no other way to see the dense forests along the rivers than going on a guided river trip, to say nothing about managing logistics in remote mountain regions. We rolled our eyes at the thought of running rivers and waterfalls in double sit-on-top kayaks without seat backs or thigh straps (wash-deck is too nice a term), but were delighted at what the doubles could do. 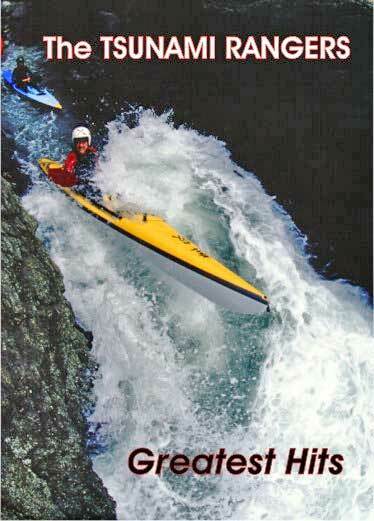 Too, we never imagined taking novices over 3-foot to 6-foot tall waterfalls in these boats. Yikes, that would probably never happen at home, but, we do admit, it worked surprisingly well! Rafts and a couple of traditional river kayaks were sometimes available, depending on the river. 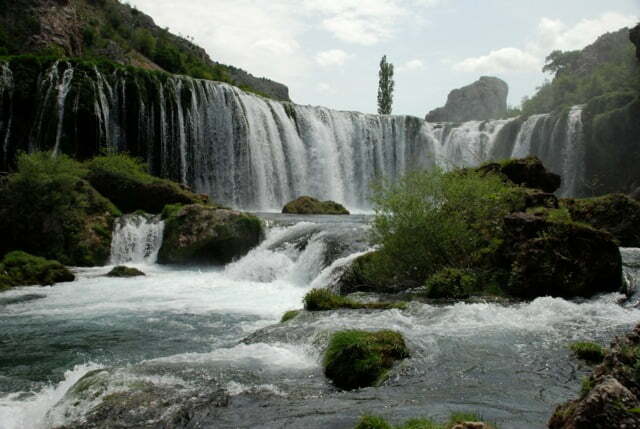 Our favorite rivers were the Mreznica, Zermanja and Dobra. Don’t miss the first two. On each of the islands (and certainly on the mainland) is more hiking and exploring than one could do in several weeks. We found many paths (some quite ancient) through agricultural areas, past ancient ruins of churches, forts, dwellings, wells, caves and more. There seemed to be no restrictions for walking, except in mountainous mainland areas still littered with land mines from the mid-1990’s war. We spent a couple of days visiting Plitvice Lakes National Park and UNESCO World Heritage Site (do not miss it! ), and several weeks exploring rivers, mountains, small communities and farms. We biked back roads through vineyards and along coastal headlands, snorkeled (not a tropical paradise, but certainly fascinating). 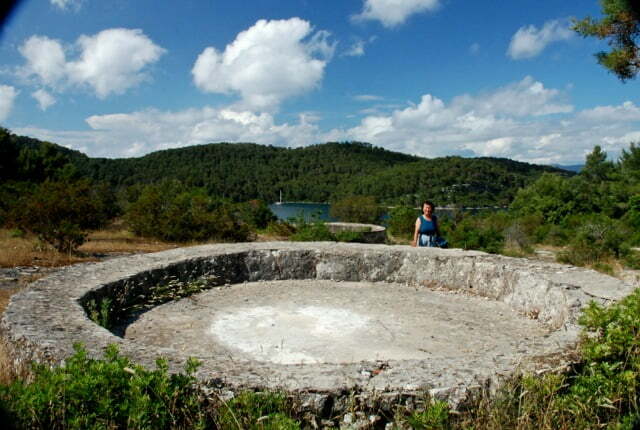 We spent a few days in Pula, Istria, in the north of the country, exploring a major coloseum and other ruins. Yes, we wandered the cities and museums of Zadar, Dubrovnik and Zagreb. We really kept moving to enjoy this small country in six weeks! We found endangered orchids, flowers we still have not identified in botanical guides, and several glass snakes, properly the Legless European Lizard, Pseudopus apodus. Add some cool birds like Red-backed Shrikes, White Wagtails, Hooded Brows, Great Spotted Woodpeckers and many more. There are a few European style, family-run car campgrounds, well-listed on web sites, but camping outside of these is unlawful. Fortunately, everywhere we paddled were small towns of perhaps 100 people, each with several families earning additional income by running what we call B&B’s. Without reservations, it was a quick task to ask around and book one of these near wherever we beached our kayak. The high season of July and August might pose problems without reservations. Bus and van transportation was very inexpensive, comfortable and reliable, but you must get advice on finding the route and schedule you want. We found no reason to rent a vehicle, although that is certainly possible. Croatian is a very odd one to begin to learn, especially if you have never spoken an Eastern European language, as many sounds are strange to us. Many locals, but not most, spoke enough English for us to get by. Our Lonely Planet book offered a helpful start and we got better over the weeks. Wonderfully warm without exception! Fair, peaceful, respectful gentle and helpful … the kind of folks you treat with honor and want to compensate fairly for their assistance. 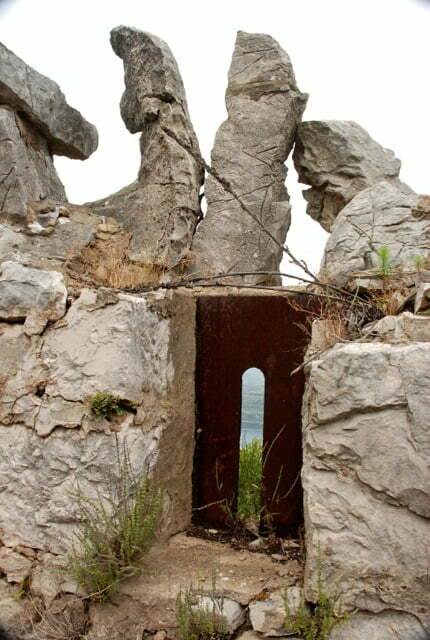 Flip through the many images on the Huck Finn site to discover what most interests you about Croatia. 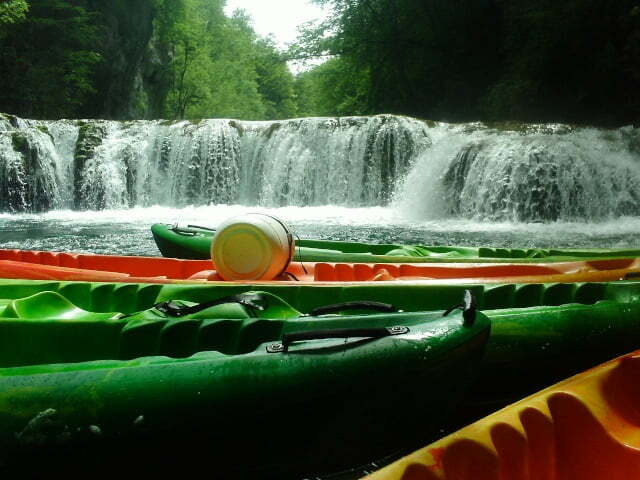 Thank you, Joanne and Doug, for a wonderful account of your Croatian adventure! Definitely a venue I will consider in the future…and I didn’t even know about it until now. The history, the culture, the natural beauty of the Adriatic, what a package! Glad you enjoyed the post, Tony! I was planning on going to Croatia myself this June with my friend Barbara Kossy but decided to postpone the trip till later. I was inspired by Rebecca West’s fantastic read “Black Lamb and Grey Falcon” about pre-WW II Yugoslavia. I wanted to combine kayak camping with a road trip through Serbia, Montenegro, and Macedonia and follow the route West took with her husband. I still hope to pull it off. If you go let us know! I’d love to hear your story. It sounds like a fascinating place.